Wow, it is crazy time for me. 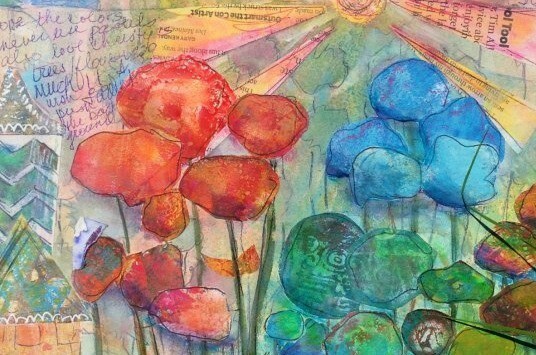 I haven’t posted my other projects from the art Journaling live event but still plan to do so. June 27 was my moms birthday. It is the first time without her. Every year I call and sing her Happy Birthday. Only a mother would put up with my singing too! I miss her but know she is okay. No more pain. I got a job in retail and have a whole new view and respect for these workers. I really like the people I work with, they are hard working, sincere and fun. I need to make ends meet and this job is helping. Last personal update then Art. My sweet kitty is very sick. We have been spending lots of time with my wonderful vet. In fact we go again in a couple of hours. He has a urinary track issue that I am hoping he can get through. He is 15 which to me is middle aged. He still eats and purrs and cuddles so that is all good. Now for Art. I haven’t finished any new pieces but have been experimenting with gesso, watered down paints, alcohol inks and Wendy Vecchi’s archival reinkers and alcohol. Of course I am using my favorite Stencil Girl stencils too. Squeezing in art is always a good thing. Thanks Ginny. It is actually part of a journal page I did a few years ago. Praying for your kitty to get well soon! It’s never easy when our furbabies are sick or hurt. Also, I want to say to enjoy and cherish those memories of your mom. It will get easier with time and it is okay to miss her. I still miss my mom after 18 years. Glad you are making time for art.. it is so important! Your art play pages looks fun! Know that AJ Live was great… awesome instructors. I went to the one when it was held in Charlotte and I still use the techniques I learned there. Thanks Carol, so sweet of you. Yes AJ is amazing and what’s also great is we get the video too and can relive it. I put some info on the Stencil Girl Club page if you are a member. I used reinkers with alcohol to get the effects. Your art work looks exquisite Denise. Keep up the good work. Hugs for you and your kitty. Thanks Traci. Shouldn’t you be packing?